Premier Supplier of High Quality Products at Low Warehouse Prices! 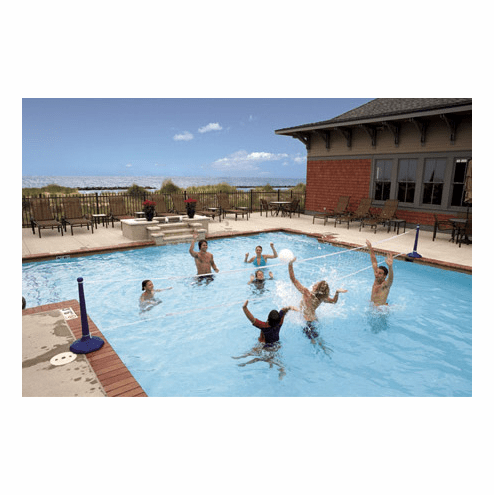 Serve, set and spike in the pool with the SwimWays Poolside Volleyball game. The two included heavy-duty bases fill with water or sand for stability, and the durable net spans up to 24 ft (7.3 m) for maximum play space. Our swimming pool volleyball game set is fast and easy to set up because no tools are required for assembly - score! Includes pro-style volleyball and instructions in the package. Great for everyday fun with the family or for your next pool party get together with friends. Copyright 2019 National Discount Pool Supplies, LLC. America's #1 Pool Supply Store. All rights reserved. Yahoo!